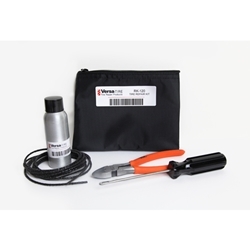 Versa-Tire RK-120 Tire Repair Kit. Save money by repairing tires instead of replacing them. Versa-Tire material won’t break down or “weep” over time like other rope plugs – repairs last the life of the tire! It’s even government tested and used by the United States Department of Defense since 1966. This convenient size kit stores easily in vehicles. USA made.